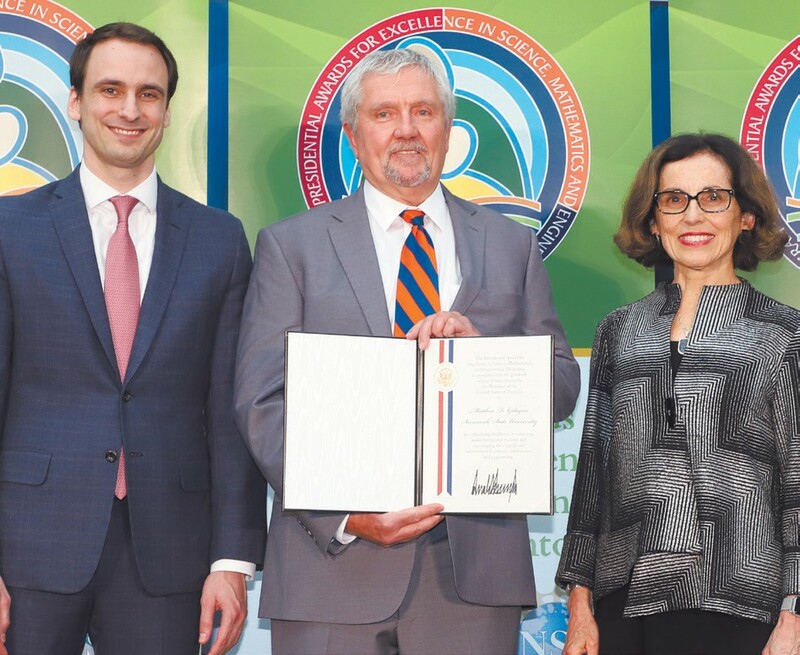 L-R: Michael Kratsios; Matthew Gilligan, Ph.D.; France Cordova, Ph.D.
Matthew Gilligan, Ph.D., professor emeritus at Savannah State University (SSU), accepted an award from the White House and the National Science Foundation (NSF) on June 26, 2018. The Presidential Award for Excellence in Science, Mathematics and Engineering Mentoring (PAESMEM) recognizes individuals and organizations across the country. Mentors guide students from the kindergarten through collegiate levels, as well as those who recently have started their careers in STEM. They share their expertise and guidance with learners, often from traditionally underrepresented groups in the STEM fields. Gilligan’s mentoring has included undergraduates, graduate students, junior faculty and peers at marine laboratories and oceanographic institutions. Gilligan, hired by Savannah State in 1979, was instrumental in implementing the marine sciences program at SSU. According to NOAA, SSU is currently top-ranked in the nation in bachelor’s and master’s degrees earned by African Americans in the U.S. in the marine sciences from 2002- 2017. Since retirement, Gilligan has shifted his focus to community outreach efforts. He serves on the board of Wilderness Southeast, Inc., a nonprofit that hosts water habitat field trips for middle schools. The program, dubbed ‘Fish-Gotta- Swim,’ is funded by grants, awards — and Gilligan’s art. “I collect hidden driftwood from salt marshes, then I up-cycle it into home furnishings. A portion of the sales go to the program.” Gilligan is also outspoken in the civic arena. He was a panelist on a Savannah forum focusing on climate change, sea level rise and resilience planning in the coastal area. He will be serving on a career panel at the Oceans 18 (ocean engineering and technology) meeting and plans to attend the Southern and National Associations of Marine Laboratories meetings this year.